And so it is the beginning of another month, which means it’s time again for Westminster Skeptics in the Pub. This month, it was the turn of the SciencePunk, Frank Swain, to address us with a talk entitled “A critique of skepticism”. Here, he basically told us where skeptics (or the skeptic “movement”, if that exists) are going wrong in engaging with others. I think most of us probably have an uneasy feeling about things we have seen done in the name of skepticism and how we are perceived by “non-skeptics”, such as my first thoughts on skeptics insular nature last month. In a way, I think Frank was putting out there our own “inconvenient truth”, that we dimly recognised before. The genius was in his delivery, which was a well-illustrated, persuasive and coherent argument. I’ve said this before, but it is a mark of great speaker at SitP, when we carry on discussing their talk long after fact, because it has been that thought-provoking. What follows is just a few of my favourite quotes from the presentation. I never take enough notes for a full round-up and there are many who are better at it than I anyway. What are the KPIs of skepticism? I’m pretty sure anything I’ve written hasn’t changed any minds. Why? I write for those who already think like me. Not on purpose, but because actually challenging someone’s opinion, in writing, is difficult. What is worse is that I hadn’t even considered this until last night. It shows a groundswell of support from those already in the know, but it doesn’t change minds or engage. It is people agreeing with their mates. I think this is also the time that Frank introduced the “Mum” test: how would you explain it to your mum and would she care? A useful teaching technique that should be applied to skepticism more. To me, that indicates a danger of talking down to people and coming across as superior – a point that is later addressed. Facts do not speak for themselves. We have a fetishism for facts. How many people have heard or used “the plural of anecdote is not data”? *many hands go up* – “instead it’s a convincing argument”. Whilst we can ask for evidence until we are blue in the face, it only convinces people that make evidenced-based decisions. Anecdotes persuade a lot more people. Frank’s example here was; user reviews on Amazon – many of us use them to make purchasing decisions based on anecdote, because we trust others. Also, how many of us can prove that the Earth orbits the Sun? I guess anecdotes/non-first hand evidence is more pervasive that we’d like to think. I struggle to agree with this, because people don’t go into arguments knowing they are wrong. Each party tends to believe (to the extent that they know) they are right. However, I can definitely buy the idea that arguing arrogantly doesn’t work. This is why I have a problem with the concept that skeptics are teaching or enlightening people. It implies a hierarchy where skeptics are above those they are talking to, who are in turn in some way stupid or primitive. That leads on to what I think was the take-home message; just because you have evidence, doesn’t mean you are better, or even right. In no way was that a complete report of the talk. It is only the bits I found most interesting and challenging (and the bits I had notes for). Most notably I missed out all of the coverage of the recent Twitter mess regarding Gillian McKeith and the level of skeptic vitriol that was shown. The inimitable and through Noodlemaz has written up the whole event. Kash Farooq and Tom Morris have some counter-arguements to the talk. Skepticat provides a well-thought out critique of some the background to Frank’s points, particularly the concept of a skeptic “community”. Last night, I attended my first British Library Talk Science event: “Science in UK Government: Where’s the Evidence?”, and made it to the second half of the night’s Westminster Skeptics. A bumper night for science, evidence and critical thinking, one might think. Actually, I think we have a bit of a problem. Of the many people tweeting at the BLTS event (#blts) I recognised many of the names and Twitter handles. I could even put a few to actual faces. Going across town to Westminster Skeptics, I met up with many of the regulars for the Q&A session and a chat afterwards, some of whom have become friends over the last 7 months of my attending and interacting on Twitter, others I could just place either faces or Twitter handles again. And as Jack of Kent pointed out, the Simon Perry, our speaker last night, is not someone who has made his name elsewhere and become a skeptic, but rather made a name as a skeptic. The long-winded point I am attempting to make is; has skepticism become an echo chamber, where we all know each other and agree with one another? Rather than wandering around the country, talking to each other in pubs, should we be focusing more effort in starting dialogue with others outside of the skeptic fold. In no way am I insinuating that the Skeptics in the Pub movement is a bad thing; it is fun, social and motivates skeptics, but I’m not sure of its value in publicising the skeptic values and position. We’ve had a warning about this before, as Evan Harris found out to his (and our) dismay. If you had looked on Twitter around the first week of May, I think you would have thought Evan was a dead cert to hold his Oxford West and Abingdon seat. As a community, we were making so much noise at each other that to us, Evan appeared more popular than he turned out to be. This was something he remarked upon last night as “observer bias”; when you are both observing and involved in something, your perception is distorted. I also think this fits in with JoK’s recent post “The Image of Skepticism“. Coming across as one insular group can also hurt our credentials. The development of skepticism into a close-knit group with its own in-jokes (homeopathy-dilution jokes, skeptic Top Trumps) can make us look like “the nasty party”. We also run the danger of having the possibility to develop a “herd mentality”, where individuals don’t appraise the evidence, but take it as a given because other skeptics (or those in authority) have already adopted a viewpoint. I’m not sure what the answers to these points or questions are, but I do think that recognition of some of these problems in the growing skeptic community is important. Do other people feel the same way? Or am I off by a country mile here? I am writing to you and the candidates from the other major parties to find out your views on science and education issues in the General Election and I will be posting all responses to my blog at http://www.blog.jstreetley.co.uk and updating the Skeptical Voter wikipage (http://skeptical-voter.org/wiki/) so that all can see where you stand. I think these issues are particularly pertinent to this constituency given the large number of HE institutions within it, so I hope you will find time to answer these questions. 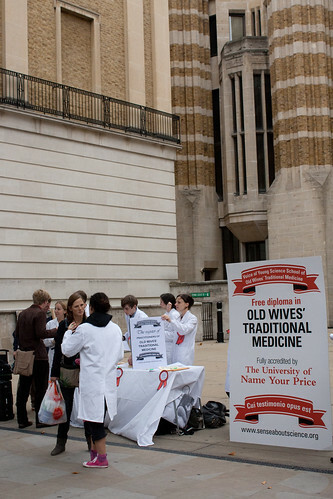 Do you support the use of public funds to provide unproven health products such as homeopathy? Including funding of the Royal London Homeopathic Hospital within the constituency? Do you agree that testing on animals (within strict criteria) is a necessary part of the development of medicines? Do you believe the science budget represents a sound investment? Will you act to protect science funding? Do you support the concept of tuition fees/top-up fees, along with any cap? Is a good Science education as important as one in English or Maths? Why? I realise your party’s stance on some of these issues is clear in their manifesto, but I would really value your personal opinions on these and I know others in the skeptic and science community will too. Some questions are taken from the Skeptical Voter Survey and others I have invented. Feel free to use them to quiz your own PPCs if you wish. I will post back as soon as each replies to me. Yesterday, the Green Party manifesto was launched. Last year I remarked (in passing and via a Times article) that the Green Party are not that hot on science/research in their manifesto for the European elections. This year in their general election video, the story is not that different, with some of the same pledges coming out to play. I have already blogged on the main parties manifesto commitments to science and education, but coming later than the other parties, and being sufficiently, well, interesting, I’ll dedicate a whole post to their pledges. Immediately ban causing harm to animals (including but not only primates) in research, testing and education, and invest in the development of alternatives to animal experiments. I’m not entirely sure I have the words to describe what I think of this pledge. Use of animals in research is clearly necessary for progress in medical research (as are humans and human tissue), despite being a fairly terrible reality. I think the BBC sums up the arguments in both directions quite well, particularly the quote from William DH Carey in a letter to the BMJ. This pledge would halt some aspects of medical research; killing people and disadvantaging us as a nation. To me this alone means I could not vote for a Green candidate. Strong regulation is one thing, but an outright ban is preposterous. Next an onslaught again genetic modification (GM). work for a complete ban on genetically modified food in Europe. Here we have a technology that could help end some of the more dubious farming methods that their manifesto also discusses at length, and yet the Green Party are against it. The mind boggles. Finally, they have this beauty on CAM. Make available on the NHS complementary medicines that are cost-effective and have been shown to work. In the interest of balance, I tried to find some science policies that I thought were positive, but alas there were none. Education is at least slightly better. Move towards ending the need for private education by creating a programme of voluntary assimilation of private schools into the state sector. Schools that remain in the private sector would have charitable status removed and would pay all relevant taxes, such as VAT. Finally, something I agree on. I feel strongly that education should be provided on a merit-based system, so that the brightest, not the wealthiest, get the best education. It is both best for the best individuals to be well-educated and for society who will eventually reap their benefit from the output of our brightest. Making it hard for private schools to operate is a step in the right direction. and other both predictable and laudable pledges that you would expect from the Green Party. Sadly just not in the areas that are strongest to me. Overall: Pitiful on science, a party I could not vote for. So following my earlier blog post on where the parties stood on libel reform, I thought I’d continue by examining another subject that I feel strongly about: science and science education. Now that the 3 main parties have published their manifestos, let’s see where they stand. Labour were first out of the traps to release their manifesto, so it is only fair they get to go first. This is great news, although an improvement and increase would be better. As Prof. Brian Cox has said (over and over), investing in science creates wealth, so an increase would actually help the economy in the long-term, and to cut it would make such a small saving in the short-term compared to long-term losses as to be non-sensical. Not sure about this one; sounds very good, but we already have enough “focus” on impact statements for researchers and trying to second-guess how useful the research will be. The problem is, sometimes you can’t know what the eventual outcome of the research will be until you do it. The oft-quoted example is Sir Tim Berners-Lee and the World Wide Web that came out of CERN with an outcome beyond that originally expected. Not entirely sure what they are getting at there. This isn’t a new body, the HEIF already exists to the tune of £150m this coming academic year. I presume they just mean they will continue what they have already announced. Not much of a pledge. …raising the education leaving age to 18. Single sciences are definitely the way forward to inspire young people to continue in science. Enjoyment of any subject comes from having a good understanding of it, and this is particularly true in the sciences, and I think this can best be taught separately. And whilst the sciences do all converge, it is also important to recognise that there is no such thing as “science” as a single entity and that the subjects can be quite different and so it is perfectly possible to enjoy different facets of science without much reference to the others. Continuing to be against the 11-plus is no great surprise, although as a someone very much in favour of Grammar schools (and educated at one), it does disappoint me. As for raising the leaving age, I can’t say I’m thrilled at that. Diversification of education and apprenticeships might lessen the blow somewhat, but I still remember being at school with those who distinctly didn’t want to be so left when they could. Not sure I could have taken it for another 2 years! Second out to be published and my party of choice, but what do they have to say? Multi-year is good, long term would be better for Research Council stability. Where is the increase? Or at least ring fence as Labour have promised. I am disappointed that there is not a more concrete promise in there. The explicit recognition of the problems encountered when measuring research impact is excellent. It is a minefield and so the implication that the Conservatives want to find a “robust and acceptable” measure is exciting indeed. This also pleases my sense that manifestos should contain specific detail! Another admirable ambition, but I feel that it is almost pointlessly vague. As someone who attended a state school that taught the International Baccalaureate Diploma, studied separate science from the age of 11 and has gone on to 2 science degrees (soon to be 3), I am living proof that a detailed science education can be inspiring and empowers those who want to learn. Therefore, I can’t sing highly enough the praises of this pledge. Overall: wishy-washy, especially given the length of the document, more detail would have been nice. Not as strong a way of pledging to protect the science budget, but I suppose “every little helps”. Still no ring-fence and certainly not a pledge to increase it though. Sad, but probably honest at least. Ensure that the decisions on the funding of research projects are made on the basis of peer review not Whitehall interference, while recognising the need for government to identify broad strategic priorities in a transparent manner. Reform science funding to ensure that genuinely innovative scientific research is identified and supported, instead of basing funding decisions on narrow impact factors. These two pledges are similar to the Tory pledge on funding and the Research Excellence Framework, and are welcome. Along with the introduction to the science section of the manifesto, I think the way these pledges are worded is proof that the Lib Dems get science. To me they just seem to hit the mark better than the similar Tory pledge. I wonder if it is more of Dr Evan Harris’ work. A pledge for open-access publishing! I really didn’t see that coming as it isn’t exactly of mainstream interest and I wonder how the higher cost of open-access publishing would be covered with the inevitable increased grant funding it would required. To me, just the recognition of the issue is brilliant though, and something the Lib Dems should be commended for. They also sneaked in this pledge regarding evidence-based policy into their science section, which again, I’m sure will go down well with the science community. Give 14–19 year-olds the right to take up a course at college, rather than at school, if it suits them better. This will enable all children to choose to study, for example, separate sciences or modern languages at GCSE, or a vocational subject. This completes the set of parties wishing to bring back single science education at GCSE level. It is worrying that they don’t think it should be taught within the school but offered as an option elsewhere, in contrast to what Tories appear to pledged though. Overall: With more detail and specific science pledges, it seems like the Lib Dems understand the science vote. In many ways, it is hard to differentiate between the parties based on their science pledges, with them all wishing a return to separate sciences and to review the way in which science grants are allocated, so it is very hard to definitively choose based on science policy alone. To me the Lib Dems have the upper hand at the moment, both because they have some superior content and pledges, but also because the way it is written and the specifics it goes into just seem to show a better understanding and honesty over the current science issues, but I think that is purely a personal feeling. In fact, I think that applies all the way through the Lib Dem manifesto from my skim read of it so far, and it is almost making me turn from committed Tory voter – especially if I want to stand a chance of outing Frank Dobson in my area – but that is another story entirely. Last night was a special edition of Westminster Skeptics, celebrating Simon Singh’s recent victory at the Court of Appeal over the meaning of the words he is being sued over (or as Dave Gorman put it “the 2nd Annual Simon Singh free-speech event”) and it was also a chance for us to hear what each of the three main parties had to say on the matter, which is of particular interest given the general election coming up and the manifestos being released this week. The Lib Dems were being represented by the veteran of Westminster Skeptics, Dr Evan Harris; the Conservatives by Joanne Cash, their PPC for Westminster North and Labour were Lord Bach, one of their Justice Ministers. This was followed by a panel discussion between Nick Cohen, Padraig Reidy, Sile Lane and Allen Green. As with every Skeptics in the Pub event, I was again pleasantly surprised at how engaging and educational standing in a pub and listening to what these renowned speakers had to say. Dave Gorman opened proceedings with his fantastic line from above about this being the “2nd annual” event, to much applause from the crowd, before giving a both comedic and serious version of the story so far. To someone that doesn’t hang off of every word from Simon’s case (or in my case, have it distilled for me by Jack of Kent), we must be a strange bunch with a lot of skeptic/libel reform in-jokes, and it was nice to see that Dave Gorman is someone who is fully in that crowd as it could be so easy for someone famous to put their name to a campaign without having the intimate knowledge at his fingertips that Dave Gorman appears to have. Indeed, why try and square up to science if you are purporting to be alternative? They honestly believe this stuff works, but it doesn’t and they are stupid. [some articles] are retracted before they’ve even been published, and that is what really scares me. Lord Bach (and Labour party) was much more committed to libel reform than I had initially expected and had some very powerful quotes to give to the room on where labour stood on the matter. Very strong words indeed, although as Evan Harris later pointed out, their manifesto still refers to “defendants” in libel cases; somewhat presumptuous. I’m particularly interested in qualified privilege for peer-reviewed journals: seems to me like a brilliant idea, as long as there is adequate peer-review to stop nonsense becoming “qualified nonsense”! Allen Green then re-iterated that while Simon’s case and the recent judgement is important, it is not the end of the campaign and is relatively insignificant for most. And finally Padraig Reidy told the story of how Sheikh Khalid bin Mahfouz, who sued Cambridge University Press regarding a book he claimed accused him of funding terrorism. CUP promptly apologised, pulped the books and donated a sum of money to Unicef on his behalf, despite the authors maintaining they had done nothing wrong. I think this very neatly sums up the libel chill in this country. So now, more than ever, we need to be watching our PPCs and their pledges as we go into this general election and make sure we have all signed the petition: lets get to 100,000 before Parliament starts again. The election gives us a chance to make a difference and change the law. This is just a few highlights of tonight’s Westminster Skeptics as: 1) I’m not a journalist (infact barely a blogger) and 2) it being in a pub, I’ve had a few pints! Prof. Brian Cox kicked off the night with an excellent presentation on science funding and how it is so small that to cut it would be insignificant; except for the huge advances and increase in GDP that it brings. To see for yourself how small government science funding is, check out this graphic from the Guardian and see if you can spot it! A good illustration of the point is that the Apollo program paid for itself 14 times over its cost in terms of GDP generated for the American economy. After this we heard from Nick Dusic of CASE (Campaign for Science & Engineering in the UK). His basic message was that there is a science vote out there to be won, and we as voters need to be stronger, more vocal and show our presence. This is a point I totally agree with. Dr Evan Harris MP (Lib Dem Science Spokesman) was also there, but he basically re-iterated Brian Cox, so I shan’t bother re-writing. He did come out with one beautiful quote during the Q&A session, but I promptly forgot it so will have to paraphrase. He was discussing the Government funding of humane animal research and said he advocated writing on the pill bottle “Only made possible by the public spending on humane animal research and testing”, and went even further to suggest we should disclose how many animals went into a treatment in the original (he suggested MRC) press release for the treatment, making very sure the public spending is acknowledged. I like this point very much: scientific triumphs need more proper celebration rather than derision or ridiculous hyperbole. The rest of the session was unremarkable (as far as I have noted anyhow), but enjoyable as ever. And we only managed to slip into homeopathy once, which I presume is some kind of record for the skeptics!